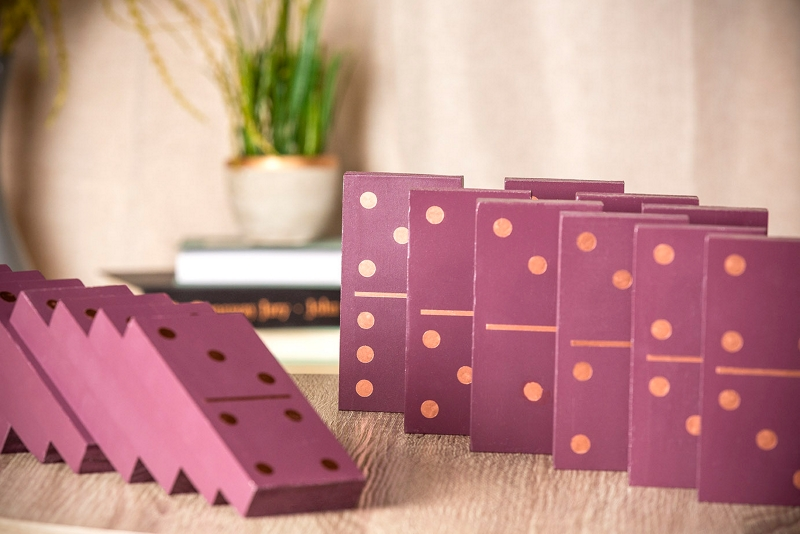 Create your own set of dominos from start to finish using Krylon®! Use safety goggles to protect eyes from dust and debris. Taking the 1"x3" wooden boards, use a miter saw to create 28 domino pieces that are approximately 5 inches in length. Sand each board for a smooth finish. Once you have finished sanding, use a tack cloth to remove any dust and debris. Line up wooden rectangles in a single file line on a drop cloth, away from any dust and debris caused by sanding. After reading the product label for proper application and safety instructions, paint all of the wooden boards using Krylon® ColorMaster™ Paint + Primer in Matte Bordeaux. Allow time to dry completely before painting other sides of the rectangular pieces and adding the lines and dots. Place a horizontal line in the middle of each domino piece using Krylon® Leafing Pens. It is recommended to use a ruler or straight edge to ensure a straight line. Paint the domino dots also using Krylon® Leafing Pens in Copper. Use a stencil for added support in creating the design. Allow to dry completely before enjoying!